Fireworks have been used in gardens for over two thousand years. Fireworks, made of bamboo, originated in China and were used to scare away bad spirits. When gunpowder was invented, about 2,000 years ago, new possibilities for making fireworks arose. Firecrackers were used at religious festivals and other celebrations. Knowledge of these devices spread to Europe and Marco Polo brought back the secret of making gunpowder. In renaissance Italy the making of fireworks became an artform. They made rockets and spinning wheels of fire. During the baroque period, kings began to put on public displays of fireworks for the subjects. 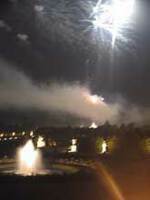 Louis XIV took the lead, as he did in garden design, and there were great firework displays at Versailles. This tradition continues.